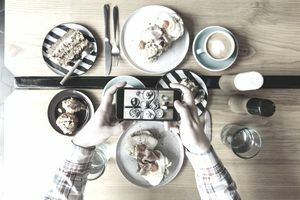 Social media can help restaurants woo new customers, check out the competition and think of new ways to reach customers through sites like Facebook, Twitter, and Pinterest. According to expert, Elise Moreau, social media is “just any Internet medium that can be used to share information with others... that can be used to describe a number of platforms including blogs, forums, applications, games, websites, and other stuff.” Other “stuff” including social media includes platforms like Facebook, Twitter, and Pinterest (just to name a few). These sites piece together conversations and images and help build an online identity of your restaurant. Read more about building a social media campaign for your restaurant. Websites have become pretty much a normal expectation for most restaurants these days. Consider, when was the last time you dug out your yellow pages to find a phone number for a restaurant you wanted to call to make reservations? More likely you Googled the restaurant name (maybe from your phone) to find the number or maybe you even made reservations online through their website. As social media sites become more and more intuitive to use and navigate, some restaurants are relying exclusively on those sites to promote their online brand, rather than spending the time or money to build and maintain a separate website. Food trucks are a perfect example. Many food truck businesses rely on Twitter and Facebook for promotions. They announce daily specials and their schedule and locations through tweets and wall posts. Even if you do have a restaurant website, you should still be on Facebook. Currently, Facebook has over one billion (yes, billion) users. It covers the gamut of age and gender – meaning everyone from your tween son to your grandma are on Facebook. Facebook is the cornerstone any social marketing campaign. While it does require regular updating to stay relevant, the reach to your audience is worth it. Read more about how to use Facebook to promote your restaurant. Twitter, which just turned seven years old, is micro-blogging: saying what’s on your mind in 140 characters or less. And it is out there for everyone to see. There is no question that Twitter is a powerful social media platform. Presidential campaigns used it. Revolutionaries in Egypt used it. While your use for Twitter may not be on such a grand scale, you can still use it to your advantage to woo customers. Like Facebook, you can post daily specials on Twitter, interesting news you think your followers (i.e. customers) will be interested in. You can also post promotions like “Retweet this tweet and get a free dessert tonight, between 5pm – 7pm.” Because the messages are so short, Twitter needs regular attention, at least a couple of tweets a day, if not more. Unlike Twitter or Facebook, which relies on words to get the message across, Pinterest relies exclusively on images to engage users, acting as an electronic bulletin board. Users “pin” images they like onto boards they create. Pinterest’s motto is “organize and share things you love.” Topics on Pinterest include weddings, hobbies, food, clothing, humor, quotes and plenty more. Recipes are among the most popular pins with users, as are party ideas, and humor — three categories that restaurants can use to build boards and gain followers. Another bonus of Pinterest is that it isn’t as needy as Facebook and Twitter. You should pin regularly, but if you skip a day or two, it isn’t a big deal. Setting up a social media guide may be a bit time consuming at first, but once you have your profiles established and know who you are trying to reach, updating your sites should only take a few minutes each day.